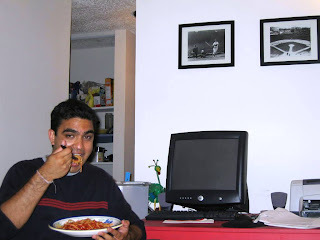 Anuj enjoying his beloved spaghetti. Fall 2005. "On a lovely, warm September evening some years ago, I decided to make cheese and mushroom ravioli in a tomato sauce for dinner. 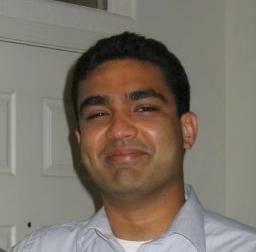 Anuj was working late that night, so he couldn't join us for our voayage-to-Italy meal. I packed some for Anuj to enjoy later. A week or so later, I received an email with "ravioli" in the subject line. In it, Anuj reported that he enjoyed the pillows of cheese, and appreciated that we had set them aside for him. I recall thinking that Anuj was such a gentleman for taking the time to compose a thank you note, and that he had a knack for making people feel appreciated. It's an email I still have in my in box, along with every other email I have ever received from Anuj. I will always treasure them." After last week's Super Bowl, the sporting world's attention shifted across the continent to the beautiful Monterey Peninsula, just south of the San Francisco Bay Area, this weekend. It is here that the annual AT&T Golf Pro-Am at Pebble Beach is taking place. 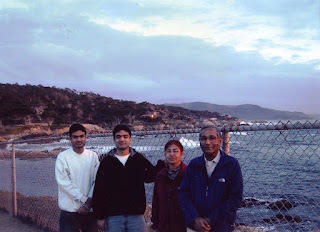 Like many others, Anuj enjoyed the stunning vistas and pervasive tranquility of Monterey Bay and the majestic beauty of its numerous golf courses. Anuj on his first trip to Pebble beach. 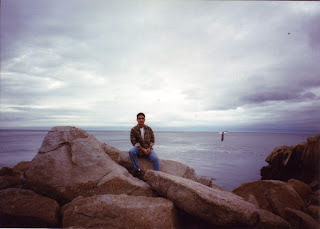 He and Neal drove down the picturesque Pacific Coast Highway to get there. Winter 1996. On a return trip many years later, this time with the rest of the family. Fall 2002. Today as families around the country gather to root for their team to take home the Vince Lombardi trophy, I’m reminded of sharing the excitement of Super Bowl XXXIX with Anuj in 2005. Neal and I hosted a pizza party. Anuj had another gathering to attend, but never one to disappoint, he arrived at our home, shuffling in with a baseball cap and his amiable spirit. He joined us for a slice of pizza and a beer. When pushed, he admitted that while he enjoyed football, it couldn’t hold a candle to his beloved baseball. I can’t remember which teams played, who won, or who performed at the halftime show, but what is permanently etched in my memory is spending time with our dear Anuj, his easy going disposition, the dimpled smile that lit up his face and every room he entered, and the way he always found time to share a few precious moments with his family. 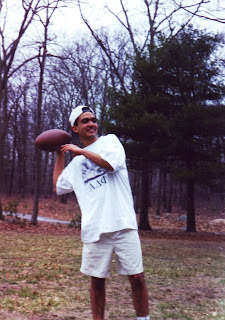 Anuj throwing a football around with friends. He had an incredible arm and could gun a tight, accurate spiral no matter how long the pass. 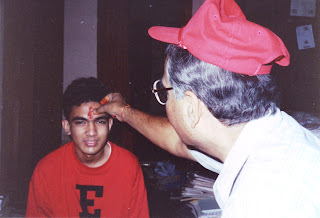 Anuj and Daddy during a family function in Michigan. Summer 1978. 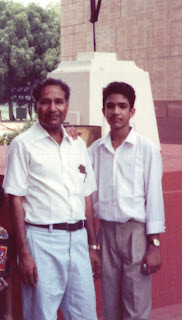 Anuj and Daddy in front of a historical monument during one of the many family vacations we took in India. Summer 1990. 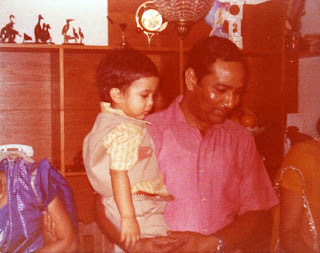 Anuj and Daddy in Anuj's room right before he was about to leave for MIT. Summer 1994.